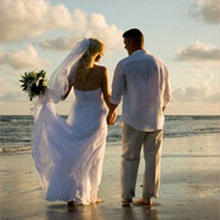 Over the recent years, destination weddings have captured the imagination and fantasy of those who are getting married. Coming out from the mundane convention of holding wedding ceremonies in the home of the bride, the phenomenon is being increasingly accepted by Indians as well as foreigners. India with its rich culture as reflected in the marvelous temples of the southern region, the forts of western Rajasthan, the beauty of the beach in Goa; have been assigned a special position as a place for an ideal destination wedding. In addition to these venues, there is the story of the majestic Taj Mahal as another option for destination wedding. Listed among the seven wonders of the modern world, the monument of love has helped evolve the city of Agra gain wide spread reputation of being a perfect location for hosting marriages. However, if you plan to opt for a quiet and picturesque location for your wedding in a tropical setting, Kerala in south India is the best answer. With its lake and food served on banana leaves, and a unique custom of the groom coming in an elephant, wedding ceremony here is a big hit. Rajasthan has a number of forts and palaces used by the former royal families. These forts and structures have proved to be a wonderful venue for a grand royal wedding. Attired with the most colourful traditional dresses, brides look amazingly beautiful with all the other accessories worn. For the record, it is impertinent that wedding planners must be consulted and takes into account about your aspirations to ensure a smooth flowing of exchanging sacred vows in India. Starting with that, engaged couple and their respective families can carry out the practical aspects of organizing a typical Indian marriage in their favourite locations. Matters related with catering, dress and outfit of the bride and the groom, proper arrangement and settings of the marriage venues are equally important. These can be guided by the concerned professionals. The issue of an approximate budget would be very much helpful in determining and planning out your idea of marriage into reality for the wedding planners.